Grumble Productions from Los Angeles presented "Poe and Mathews: A Misadventure in the Middle of Nowhere" in the Gold Venue at this years Fringe. The premise was that Edgar Allen Poe was deserted on a desert island with a bungling fool. This comedy of errors was hung on stages of grief, like denial, anger and acceptance. 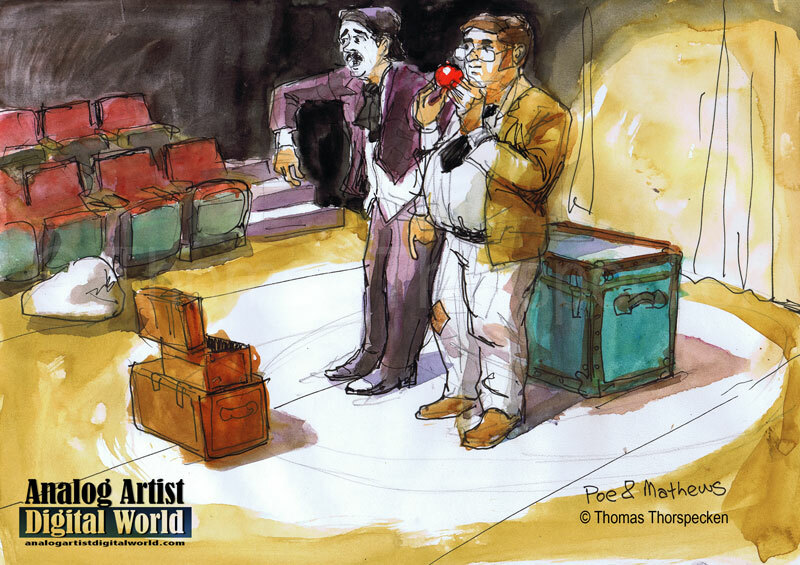 In the preview, the over weight fool ate an apple as Poe tried to concentrate. Poe lost his patience and yelled at Mathews to eat quieter. Mathews tried taking delicate baby bites but even that pushed Poe over the edge. The production reminded me quite a bit of "Waiting for Godot", with physical comedy thrown into the mix. These actors worked the lines of other shows incessantly. They won an award at the Fringe for being the most diligent marketers. I was surprised to find out that Poe was a female actor. The production was pleasant enough, but I began loosing patience, wishing the story would take me somewhere else. All the Patron's Picks are now in, so be sure to get out and see your favorite shows! Silver – Piranha the Musical!